Statue of the Virgin Mary, Prayer Chapel, Catedral de Barcelona, Barcelona, Spain. No, not the murder plot of the mystery game "Clue," but an actual hairdresser standing on the ladder in a fairy woodland. She is tending the golden tresses of this forest beauty, accenting her updo with butterflies fashioned from white birch wood shavings. Holiday vitrine, Galeries Lafayette, Boulevard Hausmann, Paris. Details of the fabulous evening gown. 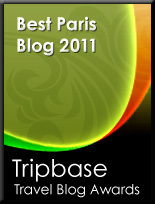 The lovely Diana of Diana Muse has honoured me with an "I love your blog" award. Merci bien, Diana! I am supposed to bestow that title on seven blogs of my choice. In the spirit of the season, I'd say that any blog on my blogroll (see my About page) deserves special recognition. And I am discovering other wonderful blogs all the time. So many creative, imaginative writers, photographers and artists who are lighting up the blogosphere. Aren't we lucky to share our thoughts, ideas and finds this way??!! Christmas sleigh, corporate headquarters for Urban Outfitters, Free People and Anthropologie, Naval dockyards, Philadelphia. Christmas lights strung above a mini art gallery. Decorative lights and a fabric-covered wall at the entranceway. My daughter Jordana, the birthday girl. It is her first birthday that we're apart, although we did get to celebrate together earlier this month. Happy birthday, Jordana! Wall of clocks, Anthropologie offices. Anthropologie store in historic building, downtown Philadelphia. An array of Christmas stockings at Anthropologie, Philadelphia. Profusion of Christmas baubles similar to ornaments at Anthropologie's Rockeller Center New York store. An Albino peacock and ornate silver, Fifth Avenue, New York. Ode to René Lalique, French glassmaker (1860-1945) at Tiffany's, Fifth Avenue. Ice storm, Saks Fifth Avenue. Carmen Miranda at the Disney Store, Fifth Avenue. Ice skating at Wollman Rink, Central Park. Ice hockey at the Wollman Rink, Central Park. Taxis and giant red Christmas balls, Sixth Avenue. The red ornaments in front of 1251 Avenue of the Americas. Mural, Sixth Avenue entrance, Rockefeller Center. Angels blowing trumpets, Rockefeller Center. Anthropologie with the Rockefeller Center tree and flags reflected in the glass. Anthropologie, Rockefeller Center. I bought a fabulous and warm teal blue beret. Oasis of calm near Museum of Modern Art (MOMA). Abstract knit pattern and neon lights, MOMA window. The reflection of the building across the street makes it appear piles of knitted goods rest on top of the building and are cascading down the front, like an unruly scarf. Highland fling, Fifth Avenue. Yes, that's a miniature castle on that mannequin's head. Girls in quilted Chanel-like outfits embark on an underwater exploration mission amongst giant sea anemones. The whimsical vitrine is part of les grande magasins de Paris annual holiday celebration on Boulevard Hausmann. Click photos to view detail of the Printemps magic. Evening gowns and party frocks at Saks Fifth Avenue, New York. This emerald green number reminds me of a Flamenco dress. Old-style Hollywood glamour, with halter gowns and fur. What shall I tell you about New York? Maybe you'd like to hear about an unexpected and romantic wedding, then toasting the newlyweds with champagne at the Plaza? Magic Obama flags. Browsing at Tiffany's. Visiting St. Patrick's Cathedral. Rockefeller Center, both before and after the Christmas tree-lighting ceremony. Visiting the Henry Darger exhibition at the Museum of American Folk Art. The Museum of Modern Art. A walk in Central Park. Dinner in Soho. Shopping at Bloomingdale's. And the incomparable Gillian, of course - the reason for the whirlwind trip to New York. So many New York (and Philadelphia) stories to tell: please forgive me for making you wait a day or two to hear them. I've brought the flu home from Philadelphia and am feeling too awful to write. Back soon.